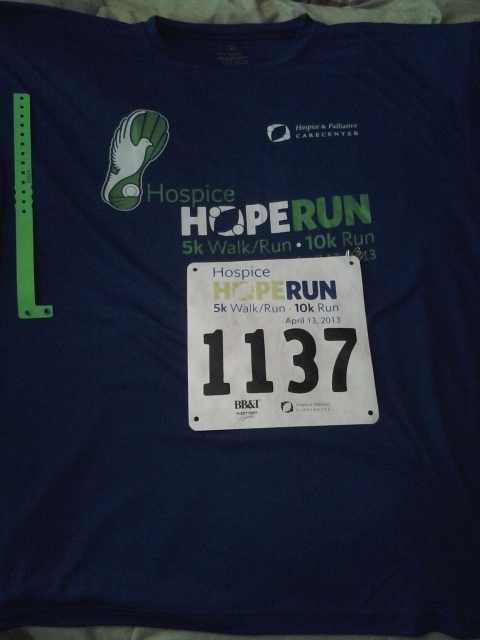 Yesterday was the Hope for Hospice 10K in Winston Salem. My second race of that distance since my knee injury at the Disney Half Marathon. This event was a combination of a 5K and a 10K with well over 1000 people, although the majority did the 5K. There were “timed” and “non-competitive” options for both races with a large portions of the 5K participants being walkers who were honoring a person or a group. This did lead to some momentary confusion at packet pick up though when they handed me the bib and it didn’t have a chip attached, or a tear off bottom portion (for manual scoring) and the bib didn’t have my name on it. By the time I got out to the car it dawned on me that I had signed up for the “non-competitive” option for the 10K. I can time myself with my garmin so I don’t need an official chip time and also I’m not in danger of winning any awards, so since the un-timed version was $5 cheaper I took advantage of the discount. They also had a post race BBQ and Beer “Pig out” which cost (go figure) $5… so hey, that worked out didn’t it? This race started and finished at the Wake Forest football stadium and shared some portions of the course with the Beat the Heat 5K. 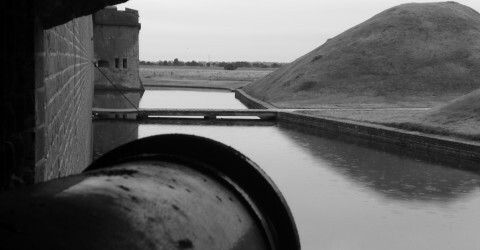 This is a tough course, hillier than it looks and also very industrial with buildings and concrete and no trees. The only shade on the course was at the turn around point when we ducked through a couple residential neighborhoods. Like most races of this distance it was an out and back course, with a few dips through a couple of neighborhoods around the turn around, presumably to add a little bit of distance. The problem with out and backs is when you have a long screaming downhill section at 2.5 miles and you know when you turn around then you’re going to have to come UP that hill between miles 4 and 5. For some reason towards the end of the race I had the time of 1:08 in my head and I was thinking that this was the time I had posted at the St Leo’s and then I was trying to remember what my 10K PR time was and I couldn’t figure it out. Turns out, 1:08 is my 10K PR. I finished in 1:13 at St Leo’s. Imagine my surprised when my 1:11 finish here was still not quite a PR, but faster than St Leo’s. It certainly felt “harder”, and yes, over the course of 6 miles, two minutes does actually make a difference in how hard you’re going. The top of that monster hill, and a water stop, gave me a slow mile 5 and was my only mile slower than 12:00. My splits were 11:30, 11:33, 11:16, 11:38, 12:29, 11:41. Shave a minute off that mile 5 (to be close to the other splits) and maybe not walk through the water stops and I would have been pretty close to a PR. Given the conditions and my current level of training I’m still in “just finish” mode and not even trying to PR, but I came surprisingly close. As I was finishing I could see the 5K walkers on the other side of the road and I was thinking “Well this is going to get interesting” but a credit to the race organizers for having two finishes. The 5K course was a true out and back and finished at the “Finish” arc that we passed about 100 yards after the start, while the 10K was an out and back but on the back in leg jogged around the stadium from the other direction, so we had an empty road and then the balloon arch that had been the Start was now the 10K finish. They had tables set up with water and gatorade in between the two finishes. Well done by the set up crew. After the finish I grabbed a cup of water, a small bottle of gatorade and then told myself “walk.. walk.. keep moving… walk”. I have a bad habit of plopping down somewhere without letting my heart rate come down slowly and then feeling like I’m gonna pass out or be sick. That cooldown walk is very very important. I grabbed a half a bagel and some other bready type things while I waited for the BBQ to start. They started pouring the beer a little early so I grabbed a beer while I waited for them to set up the food, and yes, in case you’re wondering, 10:30 AM is “Beer-thirty” if it’s post race. The BBQ was supplied by Red, Hot and Blue which I love so I was pretty excited to get my hungry hands on some. Two trips through the BBQ line and 3 beers, I’m pretty sure I got my $5 worth. After that it was head home for a much needed shower and then tackle the rest of my day which was gonna be jam packed. Big shout out to the lady from Black Girls Run who I managed to pass three times on the course, once on each side of the turn around and then near the finish, who screamed and yelled and gave me a high five all three times. The other volunteers were also very cheerful and loud and supportive. That ALWAYS helps. When I work an intersection or water stop I always cheer. The last two races I’ve been scoring at the finish which makes it harder to cheer, but you still can some.